If there is one thing you need to stick to for a glowing skin, it’s water. Dehydration is not just bad for your overall health, but also for your skin. No matter how many topical products you use, if you are dehydrated from the inside, the products won’t work. So, if you want a luminous skin and glossy hair, hydration is a must. Water flushes out toxins from your body and makes it more efficient at metabolizing fat. 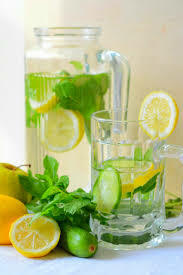 However, some people find a water a little boring so we have some recipes of miracle drinks for glowing skin that will make it easier for you to stay hydrated! Coconuts are great for your immune system health. They are antibacterial, antiviral, anti-fungal, and anti-parasite. 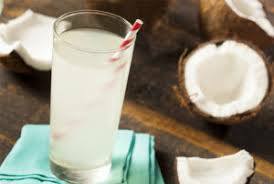 Coconut water is insanely hydrating and it is bursting with nutrients. Cucumbers are also very hydrating and have detoxifying properties. Together they make a killer combo. Fill a large jug with coconut water. Slice one cucumber and add it to the jug. Leave it to infuse for a while in the fridge. You can even use this cucumber infused coconut water as a toner! Watermelon is very hydrating. It is 92% water. It fights bloating and water retention. Watermelon also contains lycopene, which is an antioxidant that decreases inflammation. Basil is also highly anti-inflammatory. It also has antibacterial and antimicrobial properties so it is great for treating your skin from within and keep oil production in check. So, if you have an oily and acne prone skin, this is one of the drinks for glowing skin that you must try. Chop around 2 cups of watermelon and blend it. Sprinkle a handful of basil on it. Cucumbers are not just great for making detox water, you can juice them too. Cucumber juice is very hydrating and makes your skin moist, elastic, and glowing. Cucumber juice contains caffeic acid and ascorbic acid that prevents water retention. This reduces swelling and puffiness, So, drink more of cucumber juice to have a glowing skin. Detox water is not just good for your skin, but for your overall health. Best of all, it’s incredibly easy to make. Just fill a jug with about two liters of water. Add to 1 chopped cucumber, 1 lemon cut in half, around 10 mint leaves, and a half teaspoon of ginger. Put the jug in the fridge and leave it to infuse overnight. Lemons are great for detoxification. Lemon stimulates the lymphatic system’s ability to flush out toxins which accumulate in your bladder, lymph glands, and colon. Mint is very refreshing, is bursting with antioxidants, and is highly antibacterial. Cucumber is also very hydrating and contains ascorbic acid and caffeic acid, both of which are very calming. Ginger is highly anti-inflammatory. This is one of the best drinks for glowing skin. 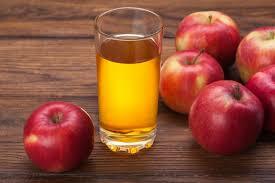 It is full of vitamins and antioxidants so its great if you want a glowing complexion. It is also highly anti-inflammatory. It can also help fight puffiness. 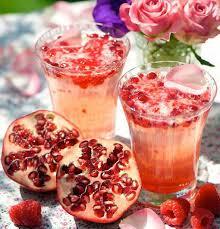 Just put a handful of raspberries and pomegranate seeds in a jug of water. Stir and enjoy! This recipe is a little different but totally worth it. Collagen is great for your skin. The addition of a collagen supplement to water will help reduce the appearance of fine and enhance your complexion. Collagen is also great for your bones. If you want to up your detox water game, here is a fruity recipe for you. This detox water is not only great for your skin but it is also really delicious! It will remove toxins from your body and give you a glowing skin and a healthier scalp. All you need are 5-6 sliced strawberries, 1 lemon cut in half, and a handful of basil. Add all these to one liter of water and leave it for one hour to infuse. This detox water has antimicrobial and antibacterial properties. It will also give you a clearer skin. It is also really hydrating. Without any doubts, this is one of the best drinks for glowing skin that you can make at home. Beetroot and carrot juice is one of the best drinks for glowing skin. Carrot and beetroot juice is one of the best elixirs in the bay and how. Beetroot contains many essential nutrients such as zinc, iron, potassium, manganese folic acid, and vitamin C. All of these are known to purify blood and this gives you a glowing skin. Carrot is loaded with vitamin A which combats wrinkles, pigmentation, acne, and uneven skin tone. 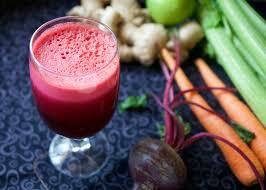 Carrot and beetroot juice is also is rich in fiber. This promotes bowel movement and cleanses your stomach. Tomato is bursting with antioxidants that help reduce the signs of premature aging such as wrinkles and fine lines and helps to make your skin look more youthful and fresher. Tomatoes also help to regulate sebum production, remove tan, shrink your pores. 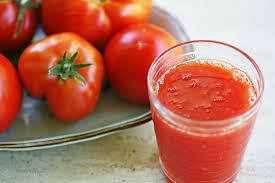 Tomato juice is definitely one of the best drinks for glowing skin. Seems like Popeye was on to something when we emphasized the importance of spinach. Green leafy vegetables are really beneficial for your skin. Spinach juice is abundant in vitamin K and iron, both of which are great for a flawless skin. Spinach also contains vitamin C and E. It also has manganese. All of these protect your skin from free radicals. Papaya is called the fruit of the angels because of its purifying properties! It contains an enzyme known as papain that clears the skin impurities and gives you a clearer skin. 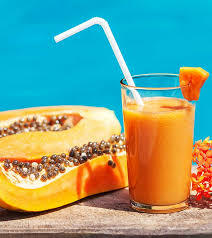 Drink papaya juice every day to reap its benefits or add it to your smoothies. Aloe vera juice isn’t just good for your skin but also for your health. It contains minerals and vitamins that give you a natural glow. It also contains hormones like gibberellins and auxin that heal the skin from within. Aloe vera juice is also good for the digestive system and when your digestive system is working fine, it helps your skin too. Apart from that, aloe vera is also highly anti-inflammatory. Aloe vera juice is also a great detoxifier and rids your body of toxins. Ginger and lemon can easily be found in most kitchens. Ginger is a good source of niacin and potassium. These are essential minerals for your body. They keep your skin healthy and glowing. Ginger is a really powerful spice and has healing properties. Ginger also aids digestion and as mentioned above, a healthy digestive system is a key to a clearer skin. 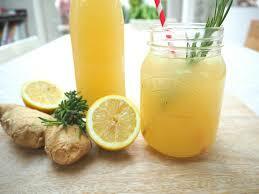 Ginger juice is also antibacterial. Ginger also has anti-inflammatory properties and therefore it is good for skin conditions such as acne and eczema. Ginger also contains vitamin C which boosts collagen production. Ginger also improve blood circulation which gives your skin a healthy glow. Because of ginger’s taste, it could be hard to have it on its own, therefore it is recommended to add lemon juice to the concoction too. Grapefruit is delicious and juicy. It makes an excellent snack and is great for your skin too. Grapefruit contains vitamin A and beta-carotene which are both great for skin as they have skin building nutrients. Grapefruit juice also has antioxidants that fight free radical and also slow down the aging process. 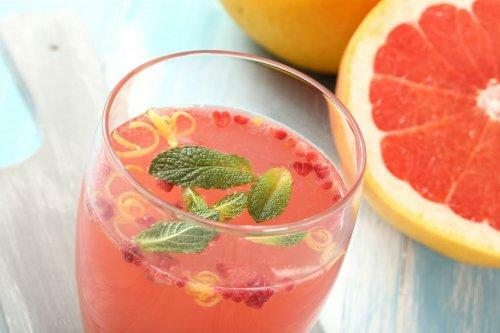 Grapefruit juice is also highly anti-inflammatory. Grapefruit is also full of vitamin C which is great for skin brightening and boosts collagen production too. Grapefruit also contains ‘s lycopene which can protect your skin from sun damage. Grapefruit is also very hydrating and makes your skin supple and moist. 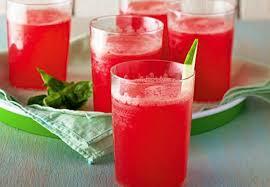 Grapefruit juice is also great for the digestive system and improves the secretion of digestive juices. This promotes bowel movement. 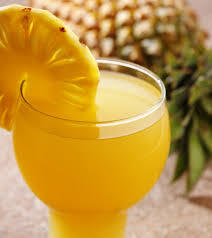 Pineapple juice is one of the most effective drinks for glowing skin. It is very hydrating and calming. It is great for inflamed and sensitive skin because it is rich in vitamin C which is healing and soothing. Pineapple also contains antioxidants which help to fight the signs of premature aging such as wrinkles and fine lines. Pineapple is also highly anti-inflammatory. Pineapple also contains dietary fiber which is good for the digestive system. Apart from that, pineapple is rich in bromelain, which is an enzyme which breaks down protein and aids digestion. Try these drinks for glowing skin if you want a healthier skin. they are super easy to make. Moreover, we have given you tons of options which means there is a lot of variety and you won’t get bored. However, you must be consistent and consume these drinks for glowing skin regularly if you really want to see a change. Have you tried this drinks for glowing skin? let us know in the comments below!